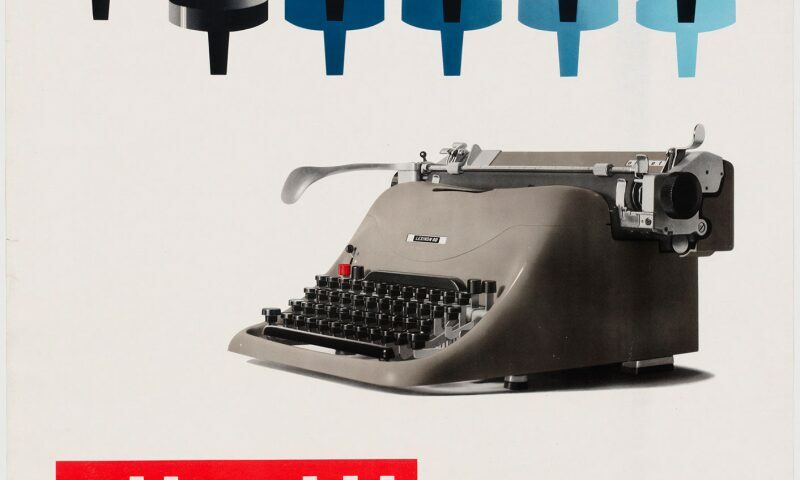 Giovanni Pintori, Olivetti Lexikon. 1954. Lithograph, 27 3/4 × 19 1/2″. Printed by Industrie Grafiche N. Moneta S.p.A. (Milan, Italy). Featuring objects from domestic furnishings and appliances to ceramics, glass, electronics, transport design, sporting goods, toys, and graphics, The Value of Good Design (February 10–May 27, 2019) explores the democratizing potential of design, beginning with MoMA’s Good Design initiatives from the late 1930s through the 1950s, which championed well-designed, affordable contemporary products. The concept of Good Design also took hold well beyond the Museum, with governments on both sides of the Cold War divide embracing it as a vital tool of social and economic reconstruction and technological advancement in the years following World War II. This global scope is reflected in many of the items on view, from a mass-market Italian Fiat Cinquecento automobile and a Soviet-era East German Werra camera to a Japanese Sony television and a Brazilian bowl chair. These works join both iconic and unexpected items made in the US, such as the Eames La Chaise, a Chemex Coffee Maker, and Irwin Gershen’s Shrimp Cleaner. The exhibition also raises questions about what Good Design might mean today, and whether values from mid-century can be translated and redefined for a 21st-century audience.